An appliance that is made to fit over the biting surfaces on either the upper or lower teeth. It is usually a firm acrylic removable bite plate that acts as a protective guard over the teeth (usually in the upper jaw). The splint provides an even bite and ensures the load is spread over all the teeth. This relieves the jaw’s muscles and reduces pain. The jaw joints, in turn, benefits from the reduced workload. The splint is also used to protect against excessive grinding, or bruxing of teeth. This often leads to cracked teeth and fillings, even crowns. 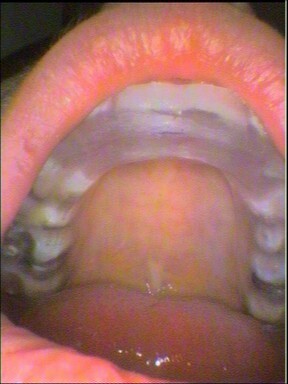 Sometimes teeth split and have to be removed. The splint greatly reduces this continual trauma to the teeth, muscles and jaw joints. Even with crowns placed on teeth, cracks can still occur beneath! The item also describes an appliance made to locate the bite and jaws in a planned new position when orthognathic jaw surgery is performed. This often involves moving the jaws into new positions for a better bite and sometimes by adding bone to lengthen the lower jaw. Always bring the occlusal splint when visiting the dentist so that it can be check that the bite on it is still even and it function well. Also if there is any treatment is to be done, such as a filling, the splint has to be checked that it still fits and the bite on it remains even. Always wear the splint otherwise the teeth may move slightly and after a couple of days it will start to not fit properly. If for some reason, such as sickness, you can’t wear the splint, then at least for a minute EACH day, put the splint in and bite firmly and then remove it. This will ensure the teeth don’t move. A side benefit of the occlusal splint is that it stops the teeth from moving and ensures a stable arch on which it is sitting on. 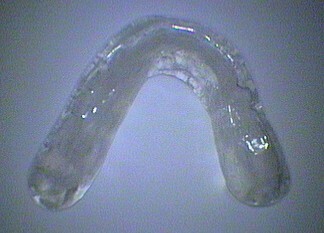 This it does by in directly “splinting” the teeth together and acting like an orthodontic retainer. It’s important to clean the appliance and keep it moist when not in use otherwise it will change shape. Adjustment of the biting surface or reshape the appliance to provide even contacts in biting and on movements of the jaws against the appliance. This is essential for the splint to function properly otherwise jaw joint dysfunction may occur! When the splint is first made it is essential that at least one subsequent visit (usually two visits) is made to check that the bite is even and there are free movements of the opposing jaw on the splint. The muscles determine the best bite once they are not inflamed and relaxed. Usually after a week of usage, we can determine whether the even bite we adjusted on giving the splint to the patient, is still correct. Most changes occur in the first of usage of an occlusal splint, so it vital that the patient returns in a week to adjust the splint to what the body wants. If the patient does not return for the adjustment, then the splint itself will cause problems by not being even or restricting the free movement of the jaws and its muscles. Regular checks of the splint’s bite, shape and fit, are an important part of its maintenance.